an extremely high output power with a balanced power distribution: 12&apos;000mW / 638nm red, 20&apos;000mW / 530nm green, 8&apos;000mW / 462nm cyan, and 12&apos;500mW / 450nm blue. The RTI NANO RGB 50 OPSL is equipped with laser diode modules and green OPSL module with a very homogenous and balanced setup. The special modules ensure brilliant colors, a homogeneous white and great color mixture. The 638 nm light red sources ensure a very good visibility of the red color spectrum. The high-precision diode arrays emit with very small beam diameters and at the same time have an excellent divergence of less than 1.0 mrad (or even <0.6mrad with the special low divergence optics). The beam precision of the single-mode diodes was significantly increased by new methods of beam shaping. The diode laser modules are manufactured by Ray Technologies in Germany. The green Coherent Taipan OPSL module stand out due to beam precision. The RTI NANO RGB 50 OPSL is equipped with high-speed scanners, that make the unit perfect for high professional and demanding applications. 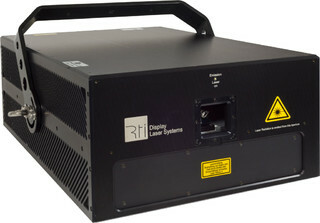 By default, the RTI NANO RGB 50 OPSL is controlled via ILDA and is equipped with advanced electronics that allow for laser calibration via browser interface. The browser interface works with PC, MAC, Linux, tablet, mobile phone, etc., so the on-site calibration of this laser system is easy and does not require any physical access to the laser after set up any more. It connects via LAN (WIFI is also possible with a suitable access point) and contains calibration options or color balance, scanning position, safety features etc. The powerful RTI NANO RGB 50 OPSL is suitable for indoor and outdoor show laser applications at concerts, festivals and other major events. Demanding graphics projections or projections over long distances are possible without any problems. The RTI NANO RGB 50 OPSL is a quality product manufactured in Germany.